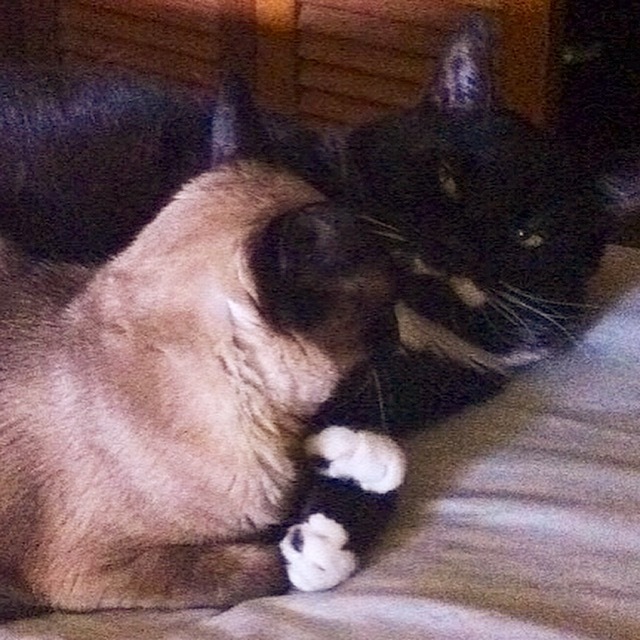 Monica and her partner Wayne adopted Rasta back in October 2015 as a companion for their 12 year-old Siamese cat MeMe. Monica recently sent us this update to let us know how he’s doing today. 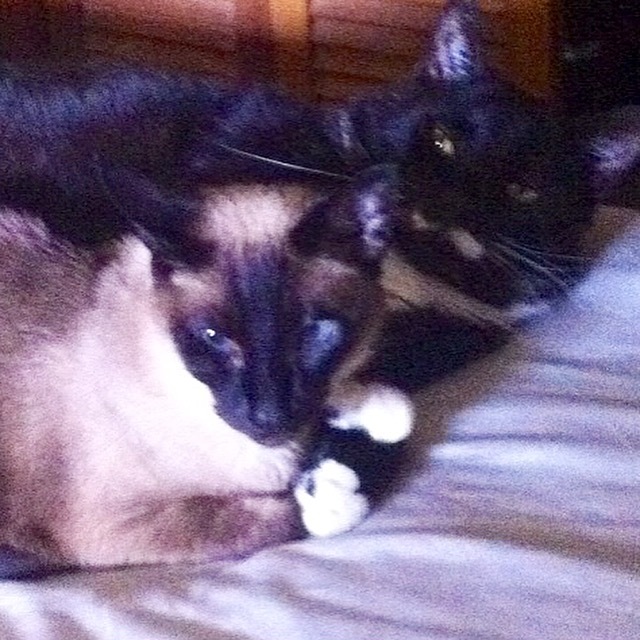 I wanted to give you all an update on Rasta and MeMe – As you can see, they are a very happy couple. Rasta (we often just refer to him as “The ManCat” because he is such a total man… cat) is an absolute joy. The more comfortable he gets, the sweeter he is. He is incredibly good-natured and patient, gentle and loving to MeMe, adores being brushed, purrs and blows drool all over me when I brush him, and plays like a kitten with his stuffed mice (he has MeMe playing again too; she quit for a while). I often see one of them trotting by with a toy in their mouth, on the way to a playdate of some kind (there is also a gruesome side to this: I often find mafia-like severed pink felt mouse ears or severed tails in my teacup in the morning, or even more grisly, the entire stuffed mouse floating face down in a water dish, the dye seeping out of it… yuck!). Rasta expanded alarmingly at first, because he was gulping his food so fast and then eating MeMe’s, natural in a former alleycat. My partner Wayne came back from a two week business trip and was horrified at how fat Rasta was – I hadn’t noticed, but he had indeed packed on the pounds and looked like a porky panda bear cub. So, we’ve all been on a diet (to keep him company) and he’s reducing gradually. One thing I’ve found: the more love I give him, the more he is reassured he will always have food and doesn’t need to stuff. The more I brush and cuddle him, the more he actually leaves food in the bowl, instead of shoving it all in his mouth. Love does indeed conquer all! Other than the tendency to rotundness, he is completely healthy. I can’t thank you all enough for your wonderful advice throughout introducing these two. MeMe was tragic, grieving, lonely, miserable and chronically fearful before Rasta ManCat came – now, she is much more social, lets me pick her up and cuddle her (NEVER tolerated this before, even when her mother was alive) and purrs tons. She is a dreadful flirt with him – but he is with her too! He often lays on his side, propping himself up on one elbow and stretching his legs out, with a provocative gleam in his yellow eyes that makes Wayne and I absolutely howl – he’s the spitting image of Burt Reynolds in the infamous Playgirl centerfold!! The dashing moustache completes the picture! I’ll try and catch him on camera for you all next time; perhaps you can include him as the centerfold in the annual VOKRA calendar! Needless to say, I obeyed. I have also seen him get her to jump up onto the kitchen counter (which he’s too arthritic to do and which is utterly verboten) and push the kitty treat bag onto the floor. She NEVER did this before his arrival!! Seriously, they are dangerous together. I hope all is well with everyone at VOKRA – keep up the amazing work! A big happy meow from MeMe and RastaManCat!